In 1978/1979 a group of committed Orthodox Christians from Lebanon, Syria, Jordan and Palestine got together to discuss the possibility of establishing an Antiochian Orthodox Church in London to serve their spiritual needs. This group consisted from; Mr. Fouad Zayyat, the Late Andre Bullata, the Late Nabih Madanat, the Late Elias Badeen, Mr Hafez Khairallah and Mr Simon Abdel-Nour. They held a number of meetings and started by collecting names and addresses of Orthodox families through their respective Embassies. On 5th August 1980, His Beatitude Patriarch Ignatius of Thrice-Blessed Memory appointed Bishop Gabriel Salibi of Blessed Memory as Patriarchal Vicar for Western and Middle Europe. Bishop Salibi arrived in Paris early November 1980 where he made his base. 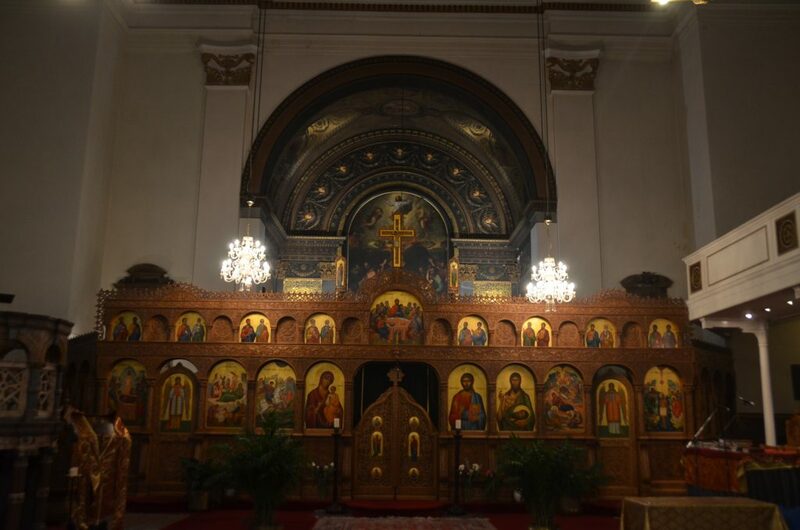 In 1981, Father Hanna Sakkab (now retired Archpriest in St George Antiochian Orthodox Church in San Diego USA) was invited to London to serve the first Divine Liturgy in Arabic in the basement of the Greek Orthodox Cathedral Hagia Sophia in Bayswater. In 1982 His Eminence the Late Archbishop Methodios Fouyias of Thyateira and Great Britain kindly allowed us to use the Chapel of the Annunciation of the Holy Virgin Mary next to Thyateira House of the Greek Orthodox Archdioceses in Craven Hill for all the services and the need of the Antiochian Orthodox Community in Great Britain. This presented a great help and support and constituted the base for the growth of the community in London. We are most thankful and grateful to the Archdiocese of Thyateira and Great Britain for their valuable assistance. The first resident priest was Father Luka El-Khoury (now Bishop of Saydnaya and Patriarchal Assistant in Damascus) who served from November 1982 until February 1983. He was succeeded by Father Joseph Al-Zehlaoui (now Metropolitan of the Antiochian Orthodox Christian Archdiocese of North America) from December 1983 until June 1984. The church had no resident priest between June and September 1984, therefore an arrangement was made with the Archdiocese of Thyateira for Archimandrite Theophilos (now Patriarch of Jerusalem and All Palestine) who was studying in Durham to come every weekend to serve the Holy Liturgy in Arabic. Father Samir Gholam was appointed to serve as a priest for the community and arrived to London in September 1984. On 17th August 1987, the Antiochian Orthodox Society was incorporated and registered as a limited company and later as a charity in June 1989. In September 1989 the society received officially the keys for Christ Church in Albany Street London NW1 and signed a lease of 20 years. Prayers and services were moved to the new church after the refurbishment work was completed and the church was renamed as St. George’s Cathedral. The Iconostas was built in Romania and the Icons were hand painted in situ by the Romanian Iconographer Mr. Michael Moroshan. After the Iconostas was completed the Church was consecrated as St. George’s Cathedral by Bishop Gabriel Salibi of Blessed Memory in 1992/1993. In March 1995, His Beatitude Patriarch Ignatius of Thrice-Blessed Memory set up the British Antiochian Orthodox Deanery following a desire expressed by a number of Anglican priests and lay people led by Archpriest Michael Harper of Blessed Memory who called themselves “the Pilgrimage to Orthodoxy”. In December 2002 the Antiochian Orthodox Society obtained a work permit visa to the Late Deacon Naim El-Hage. Deacon Naim was a great help to Father Samir plus helping and supporting the choir and carrying out all the maintenance work in the church. The sudden repose of Deacon Naim on 13th July 2016 brought shock and sadness to the whole parish. Following the repose of Metropolitan Salibi in November 2007, the Holy Synod elected Bishop John Yazigi as Metropolitan of Western and Central Europe on 17th June 2008 and was based in Paris. On 5th December 2012, His Beatitude Patriarch Ignatius IV fell asleep in Christ following a stroke. On 17th December 2012, the Holy Synod elected Metropolitan John Yazigi to be Patriarch John X Patriarch of Antioch. The Holy Synod elected Bishop Ignatius Al-Houshi as Metropolitan of the Archdioces of France, and Bishop Isaac Barakat as Metropolitan of the Archdiocese of Germany. The Archdiocese of the British Isles and Ireland was kept under the care of His Beatitude Patriarch John X until June 2015 when the Holy Synod elected Bishop Silouan Oner as Metropolitan of the Archdiocese of the British Isles and Ireland. Metropolitan Silouan arrived in London on 15th February 2016 and was enthroned on Saturday 27th February 2016. The Archdiocese at present (October 2016) have 18 parishes spread around the United Kingdom and Ireland. The Parish of St. George’s Cathedral in London is considered as the “mother parish” of the Archdiocese.